Up to this point in my racing career, I’ve taken the “shotgun” approach. Every year I want to try something new. From rallying to endurance to vintage, I’ve been lucky enough to race old slow things like a 1961 Porsche 356, high-downforce prototypes like the Wolf GB08 and my personal favorite, the WRR Porsche GT3 Cup. It’s basically been an enthusiast’s dream to sample so many types of cars and forms of motorsport. When you’re always the new team, you feel good about picking up an occasional class win or podium and beating some more experienced competitors, but at some point I realized the much more interesting challenge is to stick with something long enough and learn how to develop my skills to a much higher level. 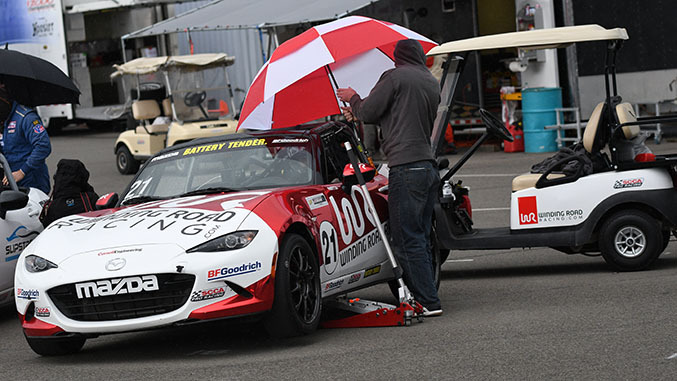 In my first season of the Battery Tender Global MX-5 Cup Championship, l’m racing against 40 skilled, experienced drivers. I hope I can slowly get better, learn from them, learn from experience and eventually be good enough to go toe to toe with the best. So that was the plan going into race 1 at Mazda Raceway Laguna Seca. 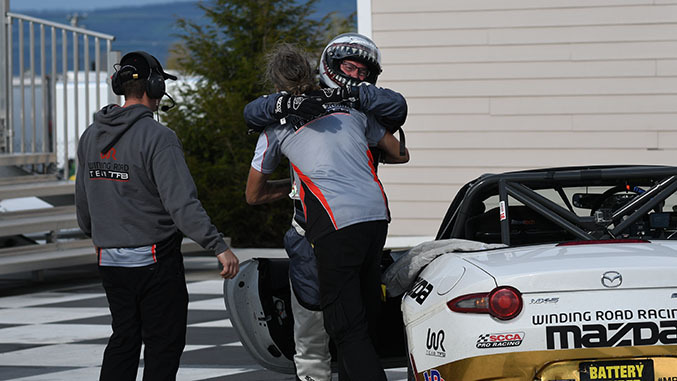 As Eisenhower (and echoing this, my advisor at Cornell) said, “plans are nothing, planning is everything,” but at Mazda Raceway, everything pretty much went according to plan for me. As I expected, things started off slowly--I qualified nearly 4 seconds off of pole and way down in 29th, but as the two races that weekend played out, I learned a lot and worked my way up the order. In both races, using my superior racecraft and some nice tips from my teammate, Mazda Raceway expert Mark Drennan, I was able to make up a ton of spots at the start and found myself in amongst some much faster cars. Running with them, I soaked up information and got myself all the way up to 16th spot by the end of Race 2, with a fast lap just over a second slower than the eventual winner. This learning thing was going great. The plan was on track and Eisenhower was obviously a fool. I even came away with a pile of ideas on how to improve next time out. Fortunately, the next round at Watkins Glen was only two weeks away, so it was time to apply it all and keep on rolling with the improvement, the learning, and the plan. A big takeaway from Mazda Raceway was that every session – even our two short practices – matter bigtime. Normally in practice I like to take my time, warm up tires, learn the track, look around to find grip, find markers and generally knock the spider webs out of my racer brain, but here in this series, it’s also important to set a fast time straight out of the box. 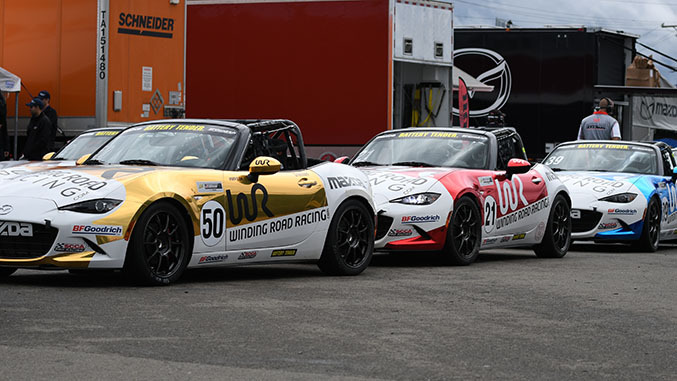 In MX-5 Cup, practice times set the grid for qualifying, so they trickle down and it’s easy to get mired down towards the back of the pack for the whole weekend because of slow lap times in practice. So, of course, at Watkins Glen, I roll out Friday morning, ready to come out of the gates flying and the ghost of Eisenhower strikes down my ECU. I limp to the pits with a misfiring engine and our heroic crew diagnoses and fixes the problem in record time, but I’m left with less than 5 minutes to the checker--barely enough time to get some heat in the tires. “Plans are nothing, planning is everything.” Time for some planning. Fortunately for me, our split qualifying format gets broken up by a rainstorm where only half the field gets dry running. The times therefore are deemed invalid and the grid for race 1 is set by championship points. This not only moves me up the grid a bit, but puts me right behind Corey, my teammate. Another big learning experience from Round 1 was the importance of teamwork in this series. At Watkins Glen, I make it through Turn 1 and I’m in Corey’s tow for the super long haul up the hill and down the torturously long back straight. The plan is back on track. Great teamwork boys and girls. And then Corey disappears. Did I mention that it was pouring rain? The spray from the cars ahead is so bad all I can see is a few pairs of tail lights, and half the time I can’t even tell which one is Corey. The race quickly degrades into something of a mess, with more laps under caution than under green. I manage to run with Corey for a while, but I get killed on one of the restarts and end up shuffling back to finish a few spots behind where I started. I feel lucky to have survived this wreck-filled race in treacherous conditions (and even more happy for Mark picking up his first win in the series). Teamwork and education continued to be a theme for Race 2, but not in the way I had planned. Because plans are nothing, clearly. I had planned to run with Marco, another teammate who was starting just behind me giving us the chance to work our way through the field together. At the start, we did exactly that. By the exit of turn 1, Marco was still right on my bumper and we had moved up nine positions, but in what was the least desirable manner possible: a massive crash on the front straight took out a quarter of the field. Marco and I narrowly avoided getting caught up in it, but three of our team cars were badly damaged. After an eternity behind the safety car, we finally go green. I’m now a handful of laps from the finish of the last race of the weekend and I’m still learning the track, having completed less than 10 laps in dry conditions all weekend. On the restart I’m gifted a couple places by more spinning and crashing. I also lose Marco in the process, but I finish the first green flag lap in the top ten. Inevitably, my time in the top ten looks to be short lived, as a group of cars looms large in my mirrors. This is where the real teamwork part comes on. In theory, teamwork can happen even with cars that are not on my team. I know I can fight and defend against these cars, but they came up on me quickly enough that chances are they’ll find a way past eventually. Defending will hurt our chances of collectively catching the cars just up ahead, so my plan, in this situation, is to allow a pass on me if it means the collective pace of the group can stay high. Then, by following these faster cars I can learn to be fast like them. We can work as a “team” to catch the cars in front of us and then, if anyone makes a mistake, I’m right there, ready to take back positions later in the race. This plan has worked for me before, but it failed miserably in this case. I held my position at the front of the group until turn 7, where the first of them slipped through. I had a bit of an over-under run on the exit, but, with the teamwork plan in mind, I slotted into line and used my extra momentum to bump-draft on the run down to turn 8 instead of attempting a pass back. Someone didn’t get the memo about teamwork though. The two cars behind me were side-by-side, Mike on the left, Robby on the right, heading into a right turn. Not wanting to relinquish his coveted spot, Mike decided he could juke to the right and out-brake me on the inside. However, as I’ve mentioned, Robby was on his right. And just so we’re clear, Robby was driving a car made of steel, not of air and thus they made contact. Through some combination of late braking and making contact with another car, Mike goes careening past me and nails the car ahead of me. At this point, I’m thinking I can just straighten the wheel, drive off into the paved runoff area and continue, having been gifted an easy run to 8th place with three competitors gone. And then Robby, out of control due to a broken tie rod from the initial impact, and still in a car made of steel, rams my right rear wheel, breaking the suspension and ending my race. 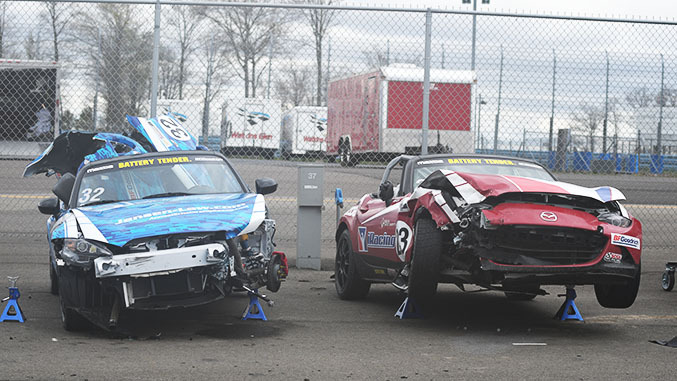 Between this frustrating incident, the insane first-lap crash and the dozen other, smaller wrecks peppered throughout the weekend that damaged more than half of the brand-new MX-5 Cup cars in the field, I can only hope everyone else now has the same commitment to learning that I do. Yes, crashing is part of racing. Yes, mistakes can happen and racing incidents occur, but this is something different. Despite the fact that we have a deep field of experienced drivers, the driving standards I saw on track at The Glen were the worst I’ve ever experienced across any form of racing. The reason for that, I would postulate, is exactly that depth of talent in the field. It’s a testament to how strong our series is that everyone has to push so hard and some end up taking big risks to get results. All of us work constantly to get faster, now it’s time to commit to learning how to be safe and clean at the same time. Really, "pro" drivers should already know that.